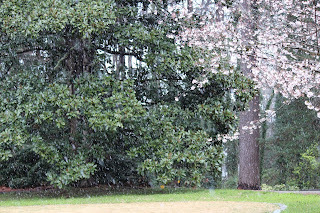 Soli Deo Gloria: Springtime snow--grumbling or gratitude? Late March...and the cold wind whipped and the snow fell. And here was my first impulse--grumbling and complaining. "I'm so tired of winter. I'm so sick of runny noses...and heavy coats...and cold, numb fingers (even with hand-warmers and gloves)...and coughing...and windshields coated with frost...and frigid feet that refuse to warm up...and snow. Yes, I'm sick and tired of snow..."
And then it hit me. Sick and tired of snow? Seriously? Consider the beauty, the delicacy, the wonder of rain that has been transformed into lacy, white flakes floating down from the heavens. As I looked around--really looked around with eyes of gratitude rather than eyes of grumpiness--I saw the stunning contrast of fluffy white flakes floating all around the lovely pink blossoms on my neighbor's tree. 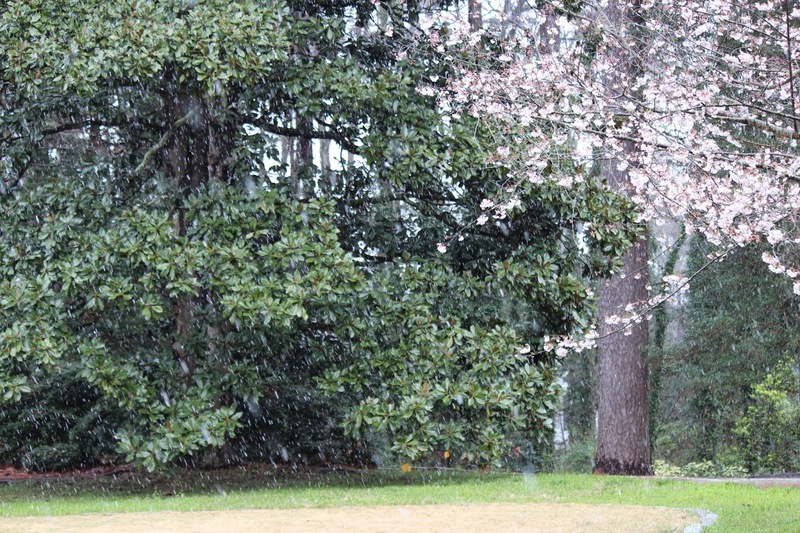 Now that's not something you see everyday--snow and springtime flowers! 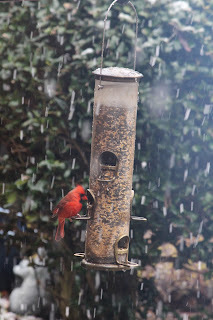 Or how about the crimson cardinal enjoying his breakfast amidst the cold and snow? Somehow he didn't seem one bit exercised by the unexpected temperature swings of late March. I nearly missed the glorious beauty of God's painting the landscape in a brief wash of white... nearly missed the wonder of blossoms coated in snow....nearly missed the way being outside in the cold invigorates and energizes...nearly missed the happiness of a hot shower after a chilly walk...nearly missed the peacefulness of watching the flakes fall while holding a hot mug of tea...nearly missed it all. Why? Because I was too busy complaining in my heart and wanting things my own way, my own preferences, my own comfort, my own expectations. Forgive me, Father, for how often my myopic vision focuses on the negative rather than the positive. Fixates on what's missing, rather than all that's there. Forces my vision of what's best, rather than resting in Your perfect ways and plans. Because let's face it--God is God. His ways and thoughts and power are infinitely beyond anything we--little dust people--could ever begin to conceive in our puny little minds. How thankful I am that God's ways and thoughts are so much higher and greater than mine. If I could comprehend the Lord and all He is doing, how big could He be? But I cannot...not even a smidgeon. And in that, I find incredible comfort and peace. I don't need to understand everything. I don't need to insist on my own way. And I most certainly don't need to grumble and fret when my sovereign Lord decides to extend winter a bit longer. Or determines that the answer to certain prayers are "Not" or "Not yet." Or works and moves in ways I don't expect or even want. It's enough for me to know that He knows. That He's in control. That He makes no mistakes. That His ways will always ultimately be for our greater good and His greater glory. That He is our Father. Our Abba. Our Daddy. And that His love for us is infinite, perfect, even scandalously extravagant...and we know that because of the cross. If you ever doubt the love of God, if you ever question His loving plans for your life, if you ever wonder if He really has your best interests at heart, gaze at the cross. Ponder the cross. Look at the beautiful, glorious Son willingly, joyfully hanging on that cross for your sins, dying in your place, and giving you in exchange His perfect righteousness. And know that He loves you so much, so unfathomably much, that He would quite literally go to the depths of hell that you might ascend to the glories of heaven with Him. Father, forgive us for our often complaining, ungrateful hearts. Thank You that Your thoughts and ways and plans are infinitely far above ours. Thank You that even we grumble, You shower us with Your grace. Thank You that You are always working and moving in a million different ways that we cannot see and do not know. Give us eyes to see, minds to trust, and hearts to thank. And when we forget, point us to the cross...the terrible, wonderful cross. You truly turn ashes to beauty. We love You, Lord. Thank you. So beautiful. So true.